The conversion rate describes the ratio of visitors of a website to the action they took. You mainly find them in connection with online marketing activities. The conversion rate is a key measuring parameter when you need to find out how successful, for example, a specific campaign or job advertisement is. But how can the conversion rate have a positive impact on the number of applications you get? 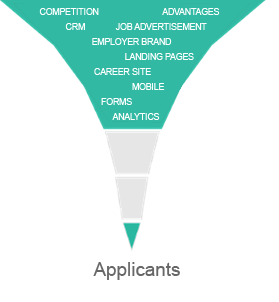 Let’s assume for a moment that your career site has 4,000 clicks per year, and you get 700 applications. If you now improve your conversion rate, you can boost the number of applications you receive, even if the number of clicks remains the same. This raises the question of how you can enhance your conversion rate. You can solve this problem using recruitment marketing. Recruitment marketing aims to convince candidates of your company. The key task of recruitment marketing is to optimize your candidate journey.